Nava Lubelski was born and raised in New York City, and now lives in Asheville, NC. Her work was recently on display in Pricked: Extreme Embroidery at the Museum of Arts and Design in New York City. In 2007, Lubelski exhibited in solo shows at OHT Gallery in Boston and LMAK projects (Williamsburg) in Brooklyn. Her work has been included in recent exhibitions at McKenzie Fine Art in Manhattan, Islip Art Museum on Long Island, and Queens Museum of Art in Queens, NY, where her art is part of the permanent collection. Lubelski has been Artist-in-Residence at CUE Art Foundation in New York City and the McColl Center for Visual Art in Charlotte, NC. She also took part in the Marie Walsh Sharpe Foundation’s Space Program in Tribeca in 2001 to 2002. Lubelski was awarded a Pollock-Krasner Foundation grant in 2008, and a New York Foundation for the Arts fellowship grant in 2005. She graduated with a B.A. in Russian Literature and History from Wesleyan University. 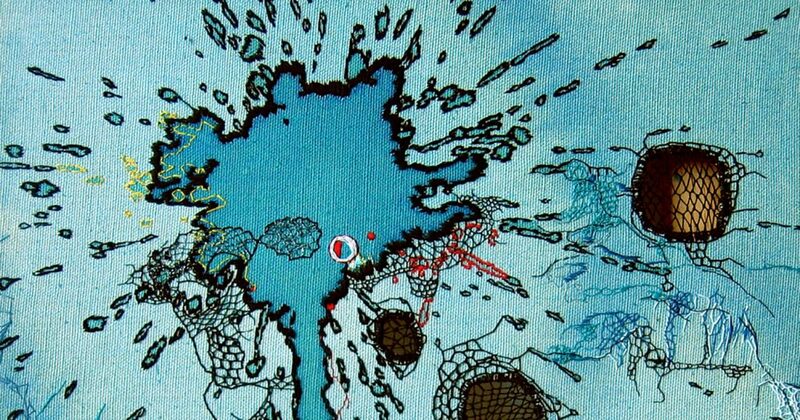 My embroidery work explores the contradictory activities of spoiling and mending, using a process of hand stitching over stains, spills and rips. The damage may have naturally occurred on used linens. In other cases, the “pattern” is created by giving vent to the impulse to destroy, tearing holes and spilling inks onto a pristine canvas. The subsequent repair is both aesthetic and structural, bringing the pieces back to a place of beauty while offering respect to the initial mark making and to the random actions or emotions that engendered them. I’m interested in the embarrassment associated with graphic forms in the shape of stains. Stains are considered unredeemable or shameful and it has traditionally been a woman’s job to attempt to obliterate them through cleaning, hiding or discarding the ruined item. My process is one of resolving these stains through a reshuffling of traditional methods of repair – the use of mending tools to respond openly to the images, discovering and enhancing their formal qualities. Through the deliberate making of spills and splatters, the work flirts with an update of Abstract Expressionism, overlaying this predominately male movement in painting with the historically feminine domestic medium of threadwork, with its traditional dependence on functionality, decoration and order. In this way it juxtaposes expressions of aggression with masochistic patience and sublimation. The work continues to play with the feminine and the sexual both through the focus on the graphic form of the traditionally embarrassing “stain” and, as in Spring at the Pole (2006), by adding peek-a-boo, lace-like inlays to 2-dimensional pieces, examining the canvas as a screen for the hidden space of wall bound by stretcher bars.